The only thing that still glitters here is the sea. 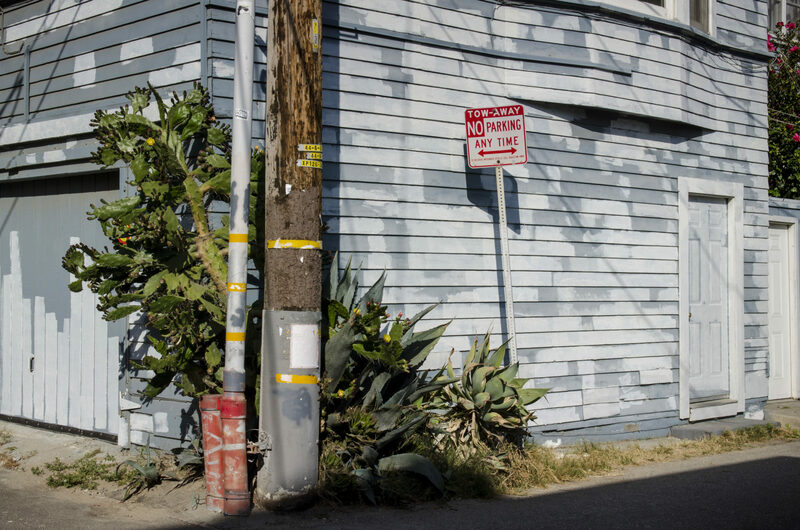 The gloss has long since faded at Venice Beach. And yet the tourists keep coming – to see and be seen. Mingling among the musclemen and junkies. Elvis is flagging, but he manages a couple more numbers. He chortles slightly as he sings, but it’s the music that counts. It’s showtime. A small crowd of snap-happy tourists are assembled around him. Mingling amongst them are a couple of his friends, who have yet to change into their own disguises. The sky above is blue, the sun gently warms the asphalt across the Venice Beach Boardwalk and if you listen carefully, you can just hear the waves of the Pacific breaking in the distance. Elvis casts a brief look around, adjusts his old Marshall amp to full gain, and launches into an adroit hip-swivel from left to right. His quiff jiggles in time to Jailhouse Rock. The sun shimmers from the rhinestones on his once-white, rather tightly-fitting jumpsuit. Elvis isn’t entirely sure of his lines and occasionally his timing is off, but he continues, laughingly. How could things be any different? It’s California, baby! And the Venice Beach Boardwalk is Elvis’s own stage. 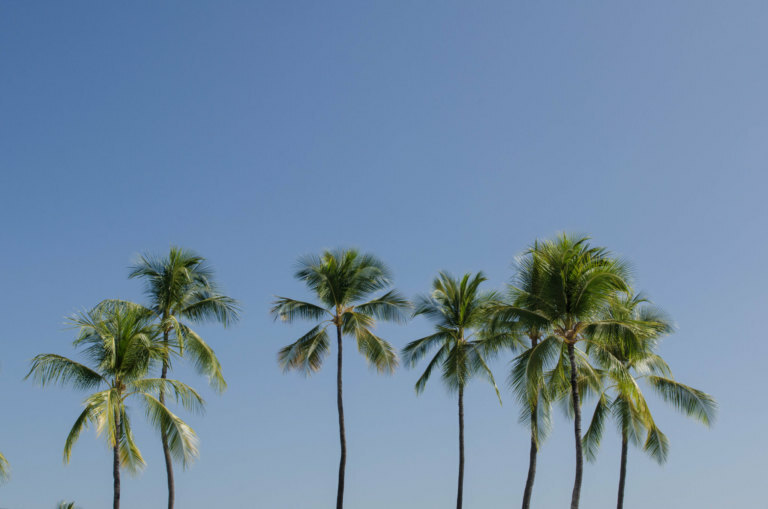 A pilgrimage to the famous Venice Beach is high on the list for many visitors to the ‘Sunshine State’ of California and its mega-capital of Los Angeles. The area’s name is no coincidence: it was inspired by the many canals leading down to the beach, originally created to make the area habitable at all. But the relative calm of the canal district is of little interest to most tourists. The majority head straight for the beach, where it glitters. And where it’s all about one thing: seeing, and being seen. 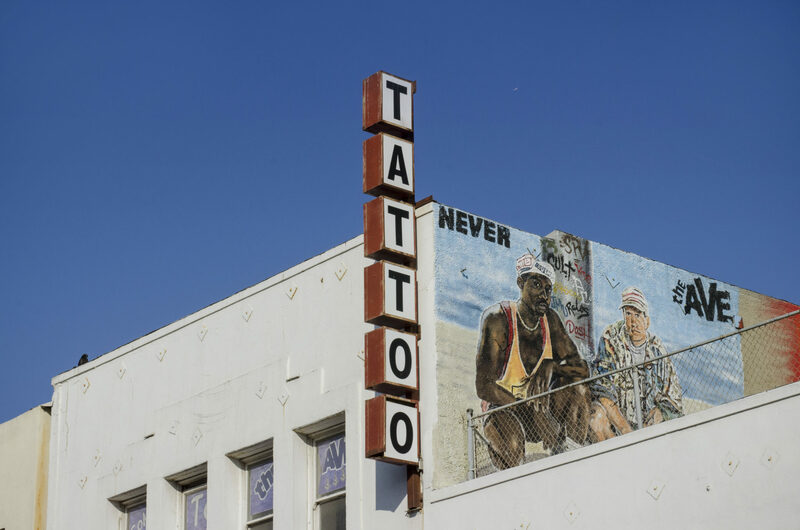 High up above the street hangs a row of oversized letters: Venice Beach is spelled out in capitals, dangling from a rusty metal chain attached to two street-lights. The intersection below is, as always, very busy. Honking taxicabs send unwitting tourists, their selfie-sticks aloft, scrambling for the sidewalks, whilst other cars weave swiftly around them. In Venice, everyone seems to do pretty much whatever they like. But for most tourists, a visit to the area begins right here: at the famous intersection with its colourful murals and the famous name tag dangling up above. This is the entrance to another world. The perfect Instagram capture for the hashtag #Venicebeach. And the beginning of a journey made by generations of freaks. Venice was once an early stomping ground for Arni, that charming Austrian with the enormous arms. When the American Joe Gold opened his first fitness studio on Venice Beach in 1965, the as-yet-unknown Arnold Schwarzenegger was among his very first members. In time, Joe lived up to the promise of his name and Arnold went on to become more than just Mr Olympia. 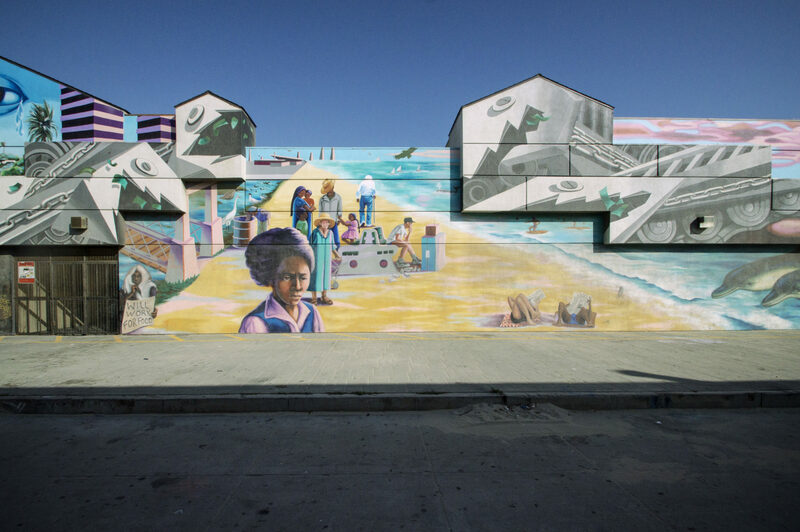 Venice Beach, too, has gone on to become something very different. 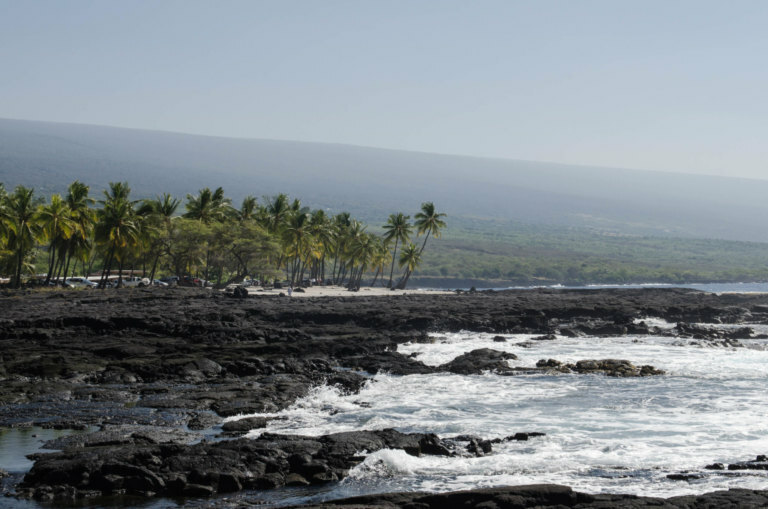 The beach which fronts onto the Pacific coastline is about five kilometres long. 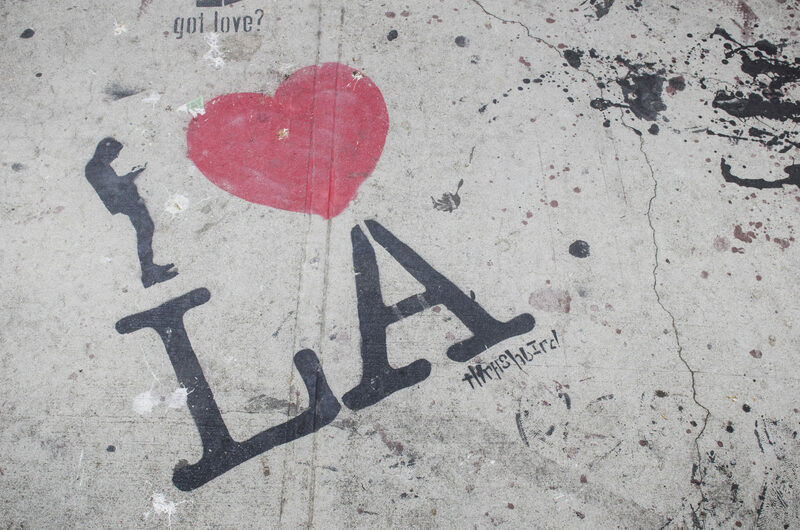 Its centrepiece, however, the famous Venice Beach Boardwalk, occupies just a few hundred feet. This stretch feels much longer when one walks along it, however. If you wander from the Venice Beach intersection towards the beach, you will soon find yourself here on the Venice Beach Boardwalk, in the midst of a freak show. On this Sunday morning, the boardwalk seems especially crowded. Elvis’ music is slowly drowned out by the thumping bass from the muscle beach. Pumped-up muscle-men turn through their paces. They lift weights, heave themselves up on rusty steel pipes or lift their own weight – whether seated or reclined. At the fringes, an audience is beginning to gather. Mostly tourists, who have heard about the muscle beach before. Schwarzenegger sends his regards. But the bodybuilders pay little heed to the crowds around them. On the contrary. Occasionally, one of them will mutter a comment. Luckily, few of the passing tourists understand English. The smell of deep-fat fryers hangs in the hair, mingling with the unmistakable scent of marijuana. And every now and then a wave of stale alcohol, from a passer-by still grappling with the effects of Saturday night. Buildings with colourful facades line the boardwalk facing Muscle Beach. But the scene has little to do with sport, these days. Keen young Americans and Mexicans stand in the entrance wearing boldly printed T-shirts. ‘Medical Marijuana here’ reads the slogan on their chests. Since the US State of California legalised marijuana, the herb has become a ubiquitous presence on almost every street corner in greater Los Angeles. The Venice Beach Boardwalk is no exception – in amidst the pumping bodybuilders and milkshake-slurping tourists. The crowds in Venice are a mixed bunch. There are those, armed with their iPhones, on the look-out for the ultimate, most Instagrammable shot. There are others, who are trying to ride their bikes from Venice to nearby Santa Monica and then there are those, for whom the American Dream has long since shattered. Opposite the colourful facades, they can be seen resting on the floor, dozing on the lawns, propped up behind street stalls or slumped under benches. Some attempt to sell art, which appears to have been produced in a drunken stupour. 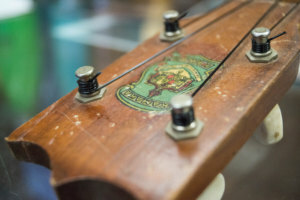 Many seem lost, forgotten and frozen in time – somewhere between a forgotten American dream and the glitz of Hollywood, their own features are happening right here. One wears an enormous pink cloak, another is entirely consumed by his joint. Beside him an elderly man with a trailing beard, grasping his whisky bottle tightly to his chest. Selling? They haven’t bothered with that for a long time. Barely any tourists pause for longer than a moment. Whether it’s the lingering stench or the crude banter exchanged between the booths, something discourages the tourists from stopping here. Beyond them, the sea still twinkles in the distance, but it seems to play little more than a sad, walk-on role in this part of the beach. Suddenly there are cheers. 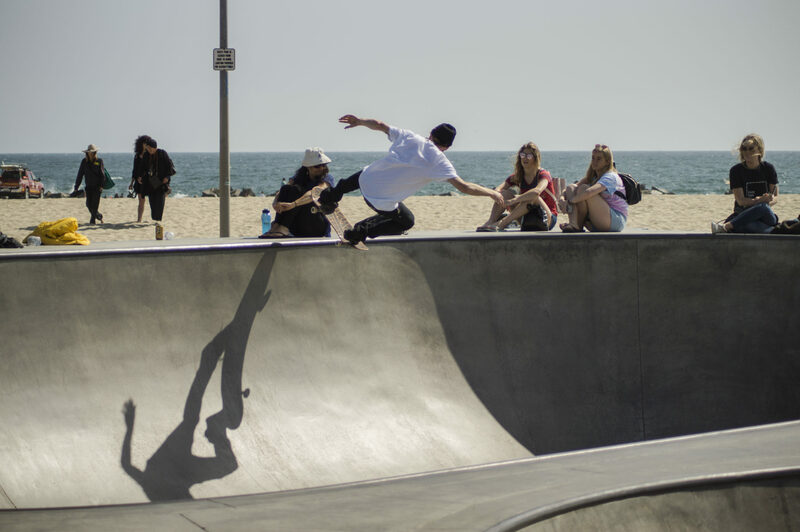 A cluster of onlookers gathers between the promenade and the beach to watch skateboarders – both girls and boys and various ages, as they practice their tricks in the Venice skate park. 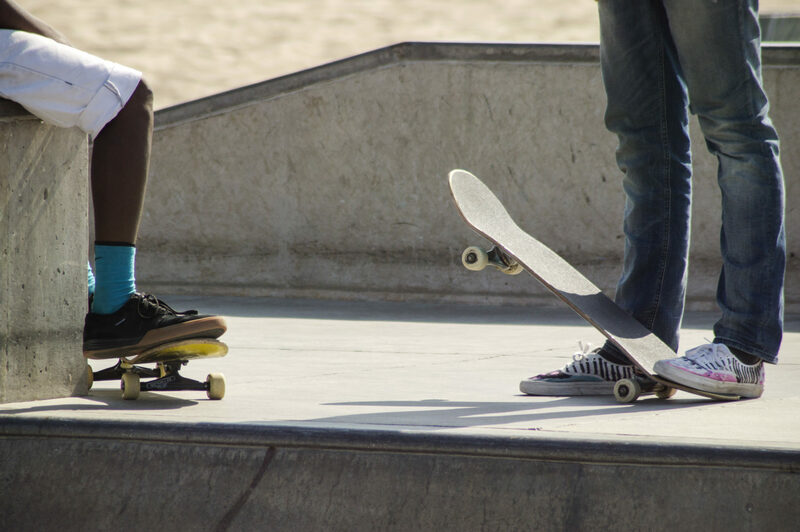 Skateboarders are as much a part of the Venice Beach Boardwalk as the bodybuilders, or the surfers far in the distance, still navigating the waves of the stormy Pacific. Today it’s a tiny Japanese girl who really steals the show. Fearlessly, she slings herself into the halfpipe again and again, turning on the other side to perform an ollie, kickflip or some or other trick. Her light, youthful frame makes anything possible. The crowds applaud, phones at the ready, waiting to capture the perfect shot of the girl in the air, her hand beneath the board and the tall palms beyond. In the meantime, the older skaters just go through their paces. Many are clearly veterans. They seem to know every angle, every curve. The flocks of tourists standing all around are a matter of supreme indifference to them. This has long been a part of Venice Beach, and it almost feels normal. Only when you look a little closer, do you notice the glassy stares of some of the older skaters, as they guide their boards around the park in dilapidated Vans, their minds elsewhere, transported by whatever substance they last took. Again there is movement on the Venice Beach Boardwalk. Filming is taking place- as it does almost every day on this famous beach. Away from the market stalls, beyond the bodybuilders and the skate-park, a film crew is busy. Oiled-up, scantily-clad women prepare a well-rehearsed routine on the Beach Volleyball court, whilst a crowd of extras applauds on cue. A real Hollywood shoot. Barely anyone is interested. 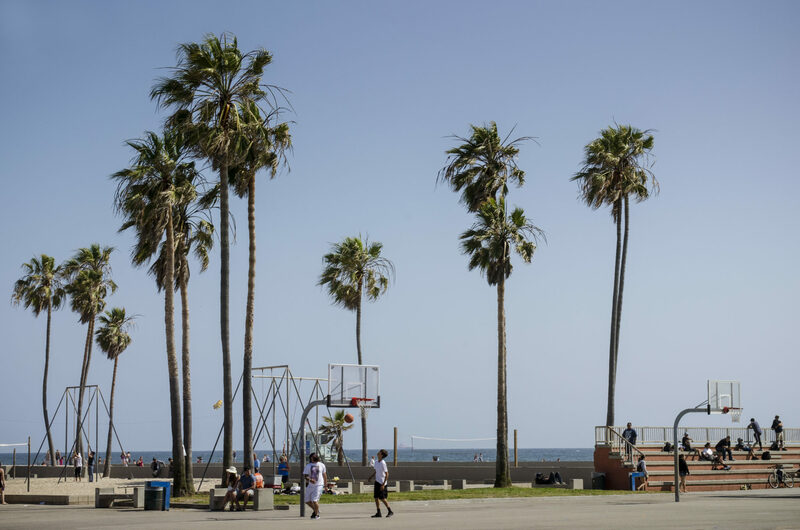 It’s just another part of Venice Beach, like all the others for whom the American dream is abandoned and unattainable. Slowly, the sun sets. Most of the day’s visitors have now disappeared into the innumerable restaurants which line the side-streets. Now it is just the locals, who assume their familiar positions. 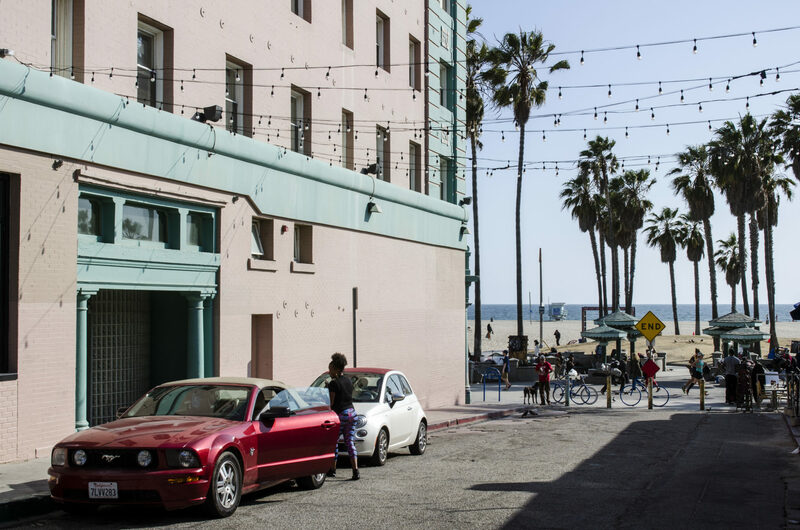 Alongside all of those who seek their luck every day here with music, dance or other talents, Venice Beach is at the epicentre of homelessness in Los Angeles. What was once downtown in now on the beach. Emerging from all the nearby laneways, laden with their worldly goods, worn-out sleeping bags and tattered tents, they shuffle into their places on the beach. Everyone knows everyone else. Everyone knows, where they sleep. And everyone understands the fate of the others. Once this night camp is established, the gym equipment falls silent. The last flips are turned in the skate-park. And Elvis packs away his case and wanders off into the balmy summer’s evening. His tent is waiting for him.